When I was a resident in about 1980 or so, someone from a production company landed in the ED at Methodist Hospital in Indy and I ended up involved somehow. A bunch of their wonks showed up and I ended up getting involved with them explaining the case. Turns out they were part of Detroit rocker Bob Seger’s road show “Bob Seger and the Silver Bullet Band”. So one of them gave me 2 tickets to the show and a backstage pass. Also gave me a T-Shirt from the British metal group “Iron Maiden” as they were involved with that road show as well. That was back in the days when I wore a medium T-Shirt and that particular shirt has been long since lost. I should have kept it as EBAY is selling authentic vintage 70s “Iron Maiden” T-Shirts (featuring “Eddie”) for US$1500 (but that includes free shipping). Iron Maiden been around 33 years now, still playing, over 80 million album sales, more than 2000 live performances and 15 studio albums. Original bass player Steve Harris is still with the band. 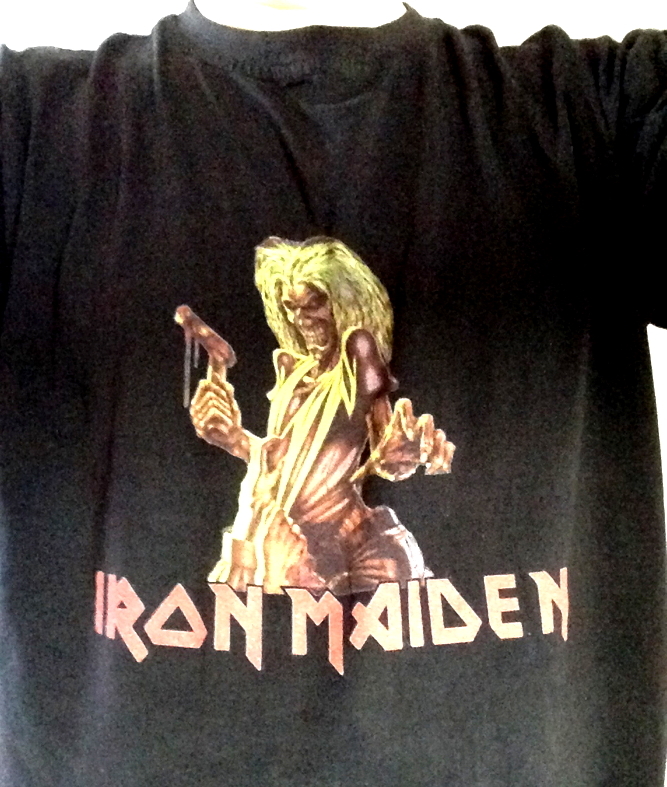 Iron Maiden has also played the T-Shirt niche like a Stradivarius. THere are a thousand variations of Iron Maiden T-Shirts and they still sell briskly. Serious collectors snap them up like hotcakes. Recently one turned up in a box of my junk. It’s a little small but it still pretty much fits. I think I purchased it in London sometime in the 80s. It doesn’t have the outrageous value of the 70’s versions but it’s pretty much the same ilk. I wore it for a CODES gig a while back. Take Home message: Save those Allman Bros T-Shirts. Who knows in 20 years? This entry was posted in Personal Notes. Bookmark the permalink.